Formed in early 2019 Killing Time bring to you an interesting mix of obvious and the not so obvious Indie/Pop/Rock songs from all corners of the globe. This new 5 piece covers band are made up of 4 talented musicians and loudmouth frontman Andy from popular covers band “Six Go Mad”. Guitars will replace any Brass and keyboard sections to make the songs sound intriguing and clever. The Bassline will pound your heart and the Drums will rattle your bones. 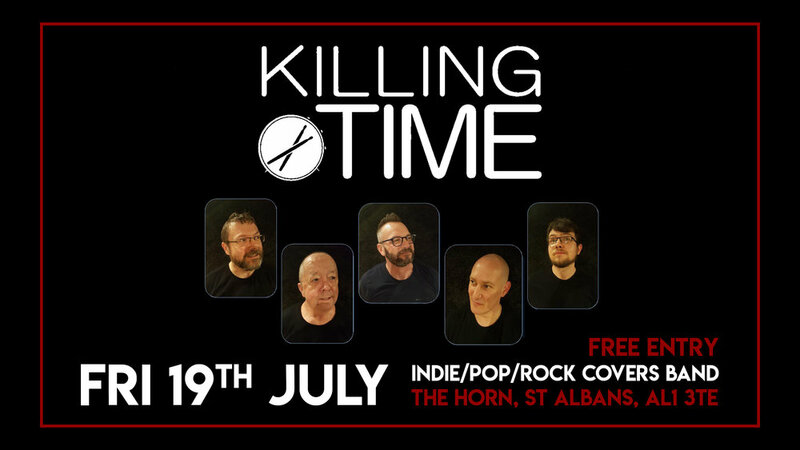 Killing Time will play you tracks by The Beatles, The Rolling Stones and Tom Jones alongside some interesting versions of songs by INXS, Julian Cope and Ugly Kid Joe to name just a few. Come and witness a band on a mission to gather a following in and around Hertfordshire and the surrounding areas. All we ask is that you join us and make their dream become reality whilst we are all having a good time Killing Time!